"Please, gather your dreams together into words." "Was this the nose that launched a thousand ships?" While the nose of Cyrano de Bergerac tends to be the feature of the romantic drama by Edmond Rostand that everyone remembers, the play goes far beyond the superficial, just like Cyrano himself. The subject of many varied film adaptations over the years, perhaps the best-beloved of all of them is this 1950 epic that rocketed Jos� Ferrer to stardom. 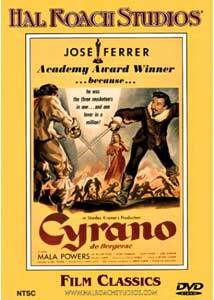 In the first half of the 17th century, Cyrano de Bergerac (Ferrer) is a man of many parts: poet, dramatist, soldier, duelist and swashbuckler. But the part of which he is most conscious is his enormous nose, a deformity that keeps him from being loved. But Cyrano does love his cousin Roxane (Mala Powers). Unfortunately for him, she has eyes only for the young and handsome Christian de Neuvillette (William Prince). Sacrificing his own happiness for that of Roxane, Cyrano agrees to look out for Christian. Ill-mannered and unable to speak well, soon Christian has enlisted Cyrano to write letters to Roxane on his behalf, romancing her indirectly for himself as he romances her for Christian. Ferrer well earned his Best Actor Oscar for this portrayal, capturing the Gascon's pride and temperamental quality as well as his amour and his despairs. With the ridiculous nose applicance precariously perched upon his face, he nonetheless makes the part breathe with plausibility and integrity. Powers makes for an adequate Roxane, completely blind to the pain she inflicts upon Cyrano as she pursues her empty-headed beau. Prince is satisfactory as the third leg of the triangle, though there's a bit of subtlety lacking in his character development in the last half of the film. Quite a bit of the film is reminiscent of seeing a filmed stage play; in particular the siege of Arras sequence feels very stagebound. Of course, to a certain extent the opening sequence, set on a dramatic stage, both prepares us for this stylized manner of presentation and reminds us of the source material. Some more purely cinematic moments come to the fore during the well-choregraphed sword fights, and the poetic duel with Montfleury (Arthur Blake) early on uses striking angles from directly overhead to just behind Montfleury's fight to convey the action. There's also a memorable use of double exposure to tell story as Cyrano smuggles letters to Roxane through the siege of Arras while superimposed over him is her face smiling as she reads. Dimitri Tiomkin contributes an appropriate (if anachronistic) Mozartean score. The costume work is excellent, with the elaborate costumes of the Louis XIII period brought to life. The sum total is a memorable picture that well rewards watching, one of the best realizations of one of the great romantic stories of all time. Image Transfer Review: The original full-frame picture (still several years before Cinemascope was introduced) looks adequate at best. The black-and-white cinematography doesn't quite glow as it should, and some sequences are illegibly dark. More brightly lit sequences have a better greyscale. The original source print is in pretty good condition, with regular spots and nicks evident throughout but little major damage. Unfortunately, the transfer (allegedly from a 35mm nitrate fine grain) is badly dated and appears to have been done for laserdisc or video. The picture is excessively soft and lacking in fine detail, but it's acceptable more or less on smaller screens. Audio Transfer Review: The 2.0 English mono track is recorded at quite low volumes and is at times difficult to make out even above reference levels. Of course, at those levels hiss is quite prominent. Clicks and pops are frequently heard on the soundtrack. It's passable, but just barely so. Extras Review: The sole extra is a re-release theatrical trailer that plays up the Oscar-winning performance of Ferrer. Chaptering is quite thin, with some stops running 13 minutes or more in length. Disappointing for such an important film. Though the feature is a frequently comic tearjerker that has a terrific lead performance, this presentation suffers from a dated transfer and a lack of any significant extras.